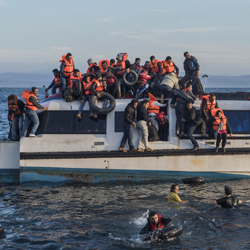 Cambridge criminologists are using emerging sources of information – from court records to Facebook groups – to analyse the networks behind one of the fastest-growing black markets on the planet: the smuggling of people into Europe. A wiretapped telephone records a human smuggler in Sudan asking a human smuggler in Libya how many were his. The response is 109, of whom 68 are now dead. The boat had capsized within sight of the Italian island of Lampedusa, killing 366 people. At the time, autumn 2013, it was the single largest loss of life to result from the booming black market in Mediterranean crossings. Worse would follow. The wiretap later records the smuggler in Sudan reproaching the smuggler in Libya for overcrowding the boat. He has since felt obliged to personally notify families. He has shelled out $5,000 in compensation in a bid to save his reputation and stop potential customers turning to one of his many rivals. Human smuggling is different to human trafficking: the smugglers’ commodity is the crossing of borders rather than control over people – and war, poverty and globalisation have caused demand for this commodity to explode. Between 2014 and 2015, illegal border crossings along the East Mediterranean route increased by an astonishing 1,641%: from around 50,000 to over 885,000. As with any market, let alone one of the fastest growing on the planet, where fortunes are to be made competition is ferocious. Dr Paolo Campana, an expert in criminal networks, joined Cambridge’s Institute of Criminology in early 2015. He describes the commerce of smuggling humans into Europe as a “quintessential free market”, with little intervention and no regulation beyond the market’s own mechanisms. “Some smugglers cheat, some overcharge, some care about safety, some don’t care who lives or dies. Some offer ‘premium’ services, fast-tracking migrants through smuggling routes. Some don’t protect people from kidnappers, others help buy them back from militias,” he says. Importantly for a pure free market such as human smuggling, there are no monopolies, says Campana. While newspaper headlines will often describe ‘Mr Big’ figures or talk of Mafia involvement, his research shows that smuggling networks are fragmented: small groups with rudimentary hierarchies jostling for trade in crowded marketplaces. “While some smuggling groups make arrangements with each other, there seem to be no exclusivity agreements and – despite the localisation of smuggling networks – very little territorial control,” says Campana. This absence of monopolies is radically different to other black markets such as Mafia-like protection rackets. Even in Sicily, where both human smuggling and the Mafia are major problems, Campana observed no connection between the two. Almost anyone can set themselves up as a smuggler: from street vendors who sell border crossings as a sideline, to tour guides who switch to smuggling, to fishermen who are already equipped with boats for the sea crossings. It is the free-for-all nature of this marketplace that gives it the flexibility to expand quickly and accommodate soaring demand. In the wake of the 2013 Lampedusa shipwreck, a rescue operation, initially called Operation Mare Nostrum, was set up to patrol the Mediterranean, and resources from the highly skilled anti-Mafia prosecution unit in Palermo were allocated to tracking human smuggling operations for the first time. Campana combed through and coded the smuggling court cases and wiretapped evidence that resulted from this shift, and has created quantitative databases to model smuggling networks. As well as interviewing the Frontex analysts in Warsaw, he has also travelled to small towns in Greece and some of the Italian islands to speak to migrants, the police and the local communities. He has just started to publish the findings from this research, including an overview of the new smuggling markets. He hopes that the first quantitative network analysis of a human smuggling operation – the one involved in the Lampedusa disaster – will also be public later this year. Campana is also working with his Institute of Criminology colleague Professor Loraine Gelsthorpe, who has worked for many years with victims of trafficking, to conduct further interviews to capture the voices and experiences of migrants and smugglers. Gelsthorpe is co-founder of the Cambridge Migration Research Network, CAMMIGRES, which aims to improve understanding of migration. “Professor Gelsthorpe and I are taking a genuinely holistic approach by combining the data-driven with the experiential,” says Campana. One of the key areas the researchers are exploring is how migrants choose who to trust in such a busy and dangerous marketplace. This comes back to reputation. While some smuggling networks are organised around ethnic lines, and word of mouth is important, digital forums have become increasingly influential in establishing trustworthiness, so part of the research involves analysing social media. Smugglers often advertise their services in Facebook groups, where they try to attract ‘customers’ by responding to queries, competing through prices, and promoting credentials in the form of recommendations from other migrants. Payment happens in advance, often through hawala, a traditional honour system that now functions through text messaging and a vast network of brokers. In some ways these platforms and processes are not that different to using eBay, for example, but with far more at stake. Campana’s research has led him to question the European Union’s focus on policing and naval operations in the Mediterranean to control human smuggling. “Naval operations are very noble; however, they have the unintended consequence of assisting the smugglers by taking the refugees off their hands very close to the Libyan coast – making the ‘product’ more attractive and, ultimately, increasing the number of journeys.